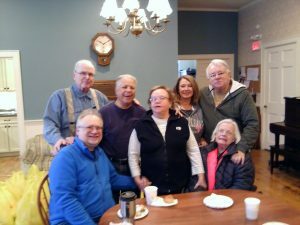 Thanksgiving has come and gone, but for 50 needy Rockland families the holiday was a little better. Through donations from our congregation and the St. George Church, we were able to assemble 50 Thanksgiving baskets complete with turkeys. 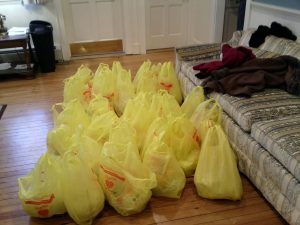 On November 20, six of us shopped at ShopRite for the basket items. Seeing the mountain of food that we were buying and hearing the reason why, one kind shopper even gave us a $20 donation. Once we got back to the church, we made an assembly line to pack the bags with food. Since the turkeys had to be kept cold, Percy donated the use of his van to store the turkeys – a freezer on wheels since the night temperature was fairly cold. On Monday morning, Carmen came to the church with a bag of bagels and her list of basket recipients. The baskets were ready to go and by 11 AM, they had all been picked up. 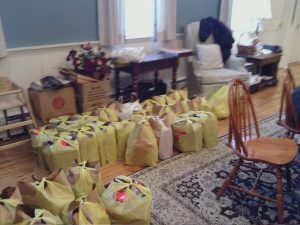 Thanks to everyone who contributed donations, shopped, assembled the baskets, and distributed them. You made a difference to our neighbors in need. Help make Thanksgiving a little brighter for a needy neighbor. New Hempstead Church has a long tradition of donating “Thanksgiving Baskets” to local families in need. Be sure to bring your food items to church on Sunday, November 20 so that we can distribute them before Thanksgiving. You can also sponsor a basket, and we’ll do the shopping for you. We’ll need volunteers on November 20th to shop and assemble the baskets. Contact Laura Bidon with any questions, or Carmen Bermudez if you know a family in need.